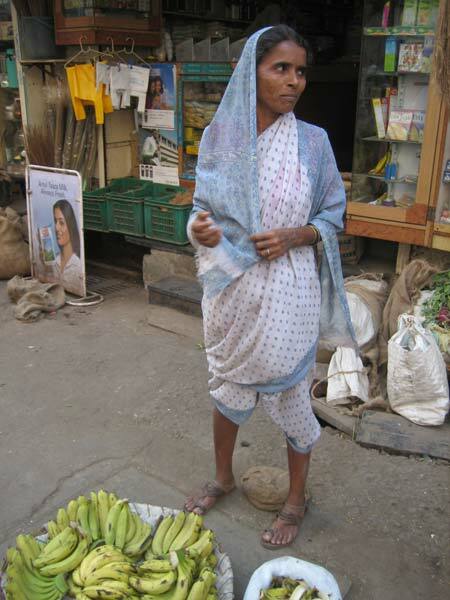 There are so many ways to wear a sari. Working women don't make such a fuss about everything being perfect, they are just clothes after all. Every woman develops her own unique way of draping her regional style. While the Nivi drape has become the standard in India, these other drapes are still to be seen. The pleats are tucked into the back waist. 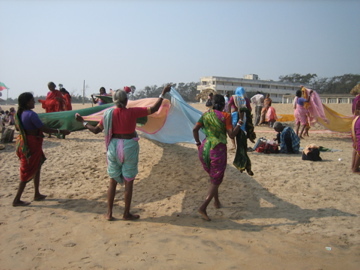 A practical drape for drying sarees on the beach. 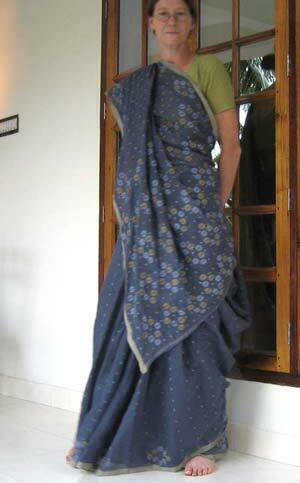 Gujarati style with the pallu draped from back to front. A great way to show off and admire the pallu yourself. Simple short kaccha style worn without petticoat. 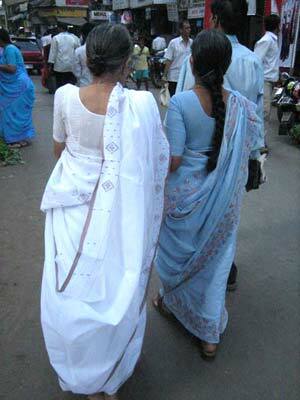 Ilkal handloom with striking pallu, worn over the head. 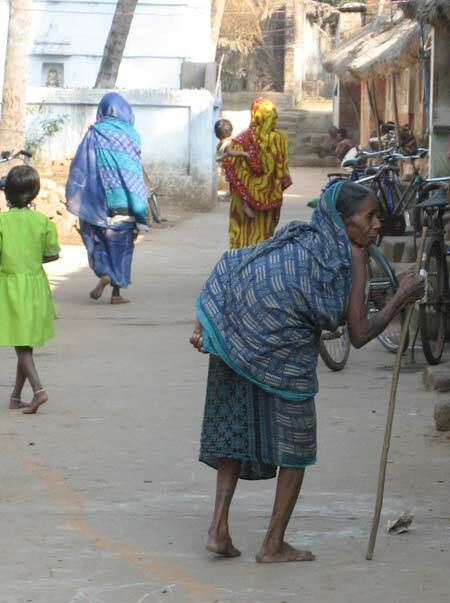 Village women wearing the Oriya Drape. 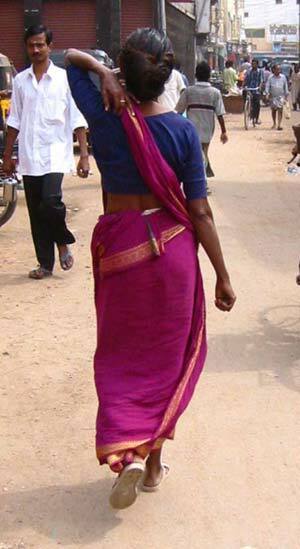 In many places in rural India women still go comfortably without a choli, which one must admit is a lot cooler and more comfortable. With this drape it is very easy to obscure the breasts. 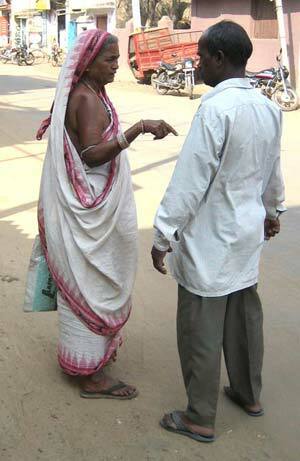 Not shy, she quickly stripped me of my nivi drape and rather messily rewrapped me the "correct" Oriya way. 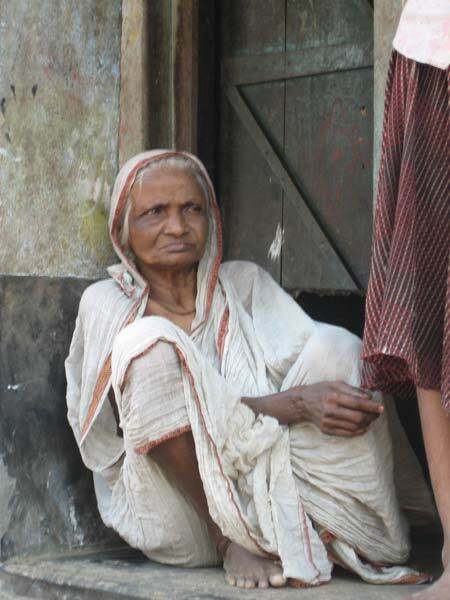 Below you can see in the front, back and side view, the ingenuity of the Oriya drape, very similar to the bengali sari but with it's own flourishes. 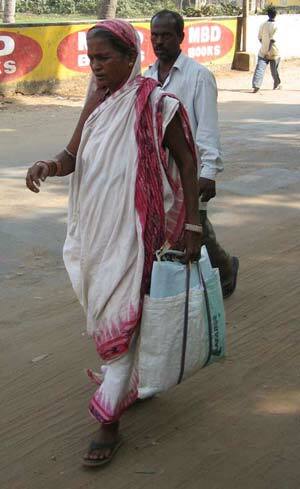 She is wearing a traditional Orissa sari. These sarees are much thicker and shorter - usually 5 meters or less and their thickness makes a petticoat totally unnecessary. 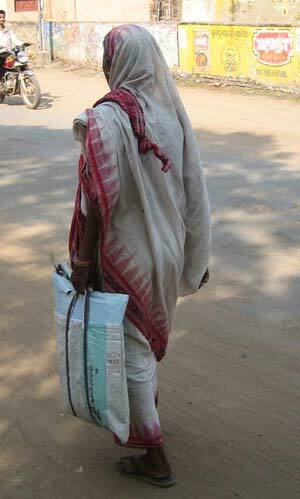 how to wear a sari: pinkosu section. 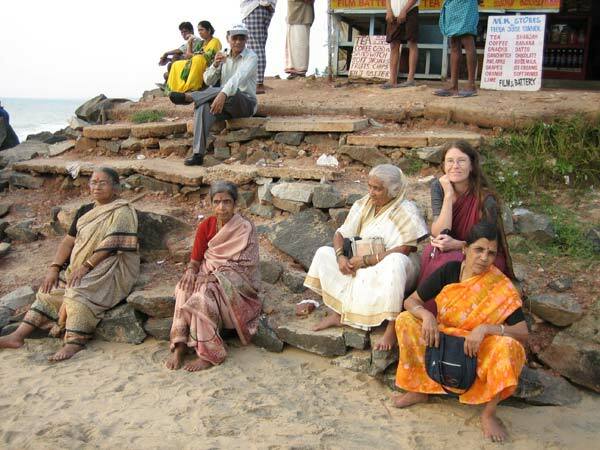 Watching the sunset with the ladies on Kovalam Beach. 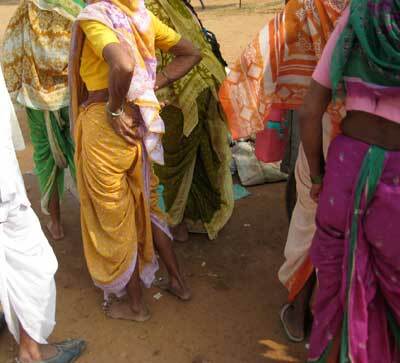 A clan of Maharastrian's sporting 6 yard kaccha drapes in the early morning rush at the Konarak temple in Orissa. 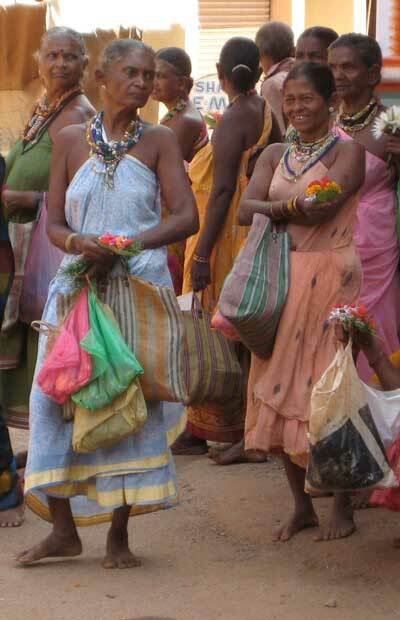 The tribals in this part of coastal Karnataka wear a very interesting drape. 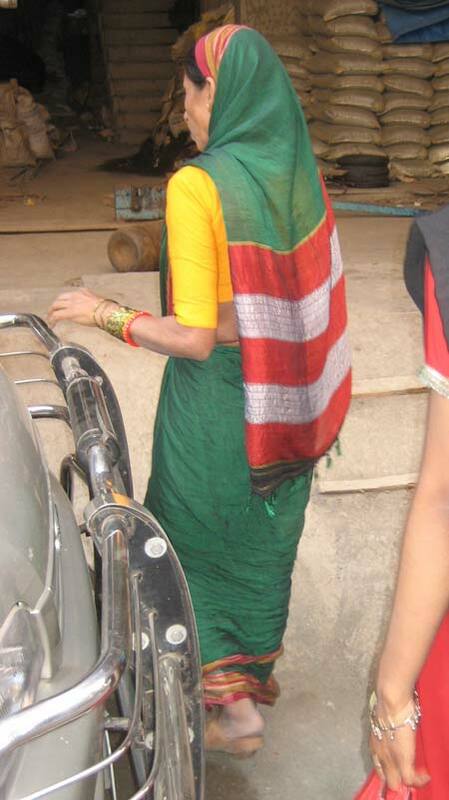 It seems they cut the sari in half and twist the upper border into a rope and wrap it around their necks and attach it to the wrap of sari around the body. This drape obscures the breasts and looks so cool and comfortable. 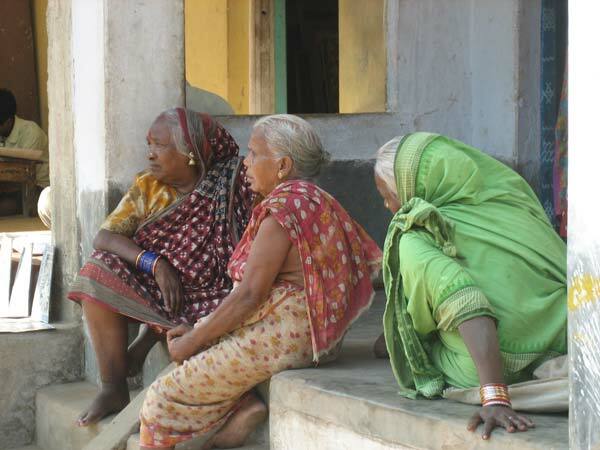 How lucky they are not to have to wear a choli and petticoat in the heat! What is not to love about these fabulous textiles, what adventures await those willing to step out of the narrow confines of western fashion! 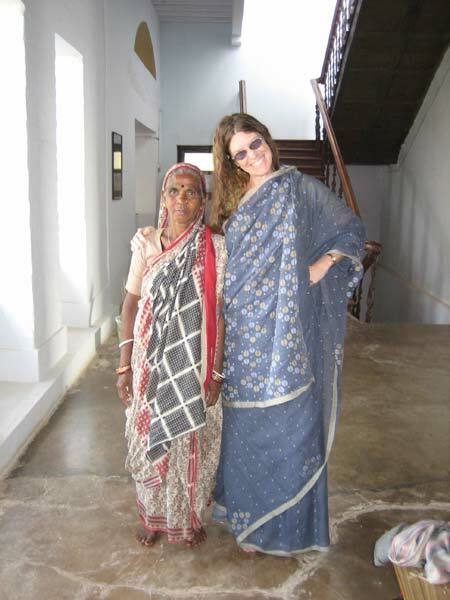 Hear what the sisters have to say about their sari experiences. Have some sari fun and attempted flight on an afternoon bike ride in sarees. If you are interested further reading about sarees and learning general textile terminology please visit the Glossary of sari terms and the Bibliography.